A hierarchy of biological organization Biological organization extends from the microscopic scale of the molecules and cells that make up organisms to the global scale of the entire living planet. Hierarchy of life, or Biological organization is the hierarchy of complex biological structures and systems that define life using a reductionistic (complex system is nothing but the sum of its parts) approach. The study of life extends from the microscopic scale of the molecules and cells that make up organisms to the global scale of the entire living planet. We can divide this enormous range into different levels of biological organization. The structure of living organisms including those of entire populations and ecosystems is organized in a hierarchical fashion that allows a systematic exploration of the question ‘What is life?’ The traditional hierarchy, extends from atoms (or lower) to biospheres and biomes. The higher levels of this scheme are often referred to as ecological organization. Each level in the hierarchy represents an increase in organizational complexity, with each "object" being primarily composed of the previous level's basic unit. The basic principle behind the organization is the concept of emergence—the properties and functions found at a hierarchical level are not present and irrelevant at the lower levels. The biological organization is the fundamental premise for multitude areas of scientific research, specifically in medical sciences. Without this important degree of organization, it would be impossible to study the effect of various chemical and physical phenomena to diseases and body function. For example; fields such as cognitive, neuroscience could not exist if the brain was not composed of specific types of cells, and the basic concepts of pharmacology could not exist if it was not known that a change at the cellular level can affect an entire organism. Such kind of examples extent to ecological as well. For instance, DDT's direct effect occurs at the subcellular level, but affects higher levels up to and including multiple ecosystems. Thus, a change in one atom could change the entire biosphere. Human tissues Cells group together in the body to form tissues – a collection of similar cells that group together to perform a specialized function. There are 4 primary tissue types in the human body: epithelial tissue, connective tissue, muscle tissue and nerve tissue. According to theory of evolution, the first organisms which came into existence were unicellular, i.e., their bodies were made of single cells. 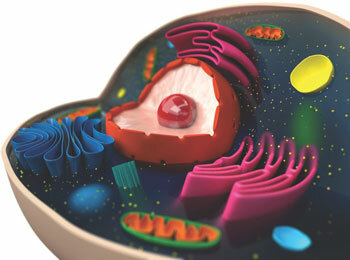 The single–celled body of unicellular organisms perform all biological activities. Some of the unicellular organisms later evolved into multicellular organisms. Animals are multicellular organisms with their specialized cells grouped into tissues. A tissue is an ensemble (a unit or group of complementary parts that contribute to a single effect) of similar cells and from the same origin, that together carry out a specific function. These are called tissues because of their identical functioning. 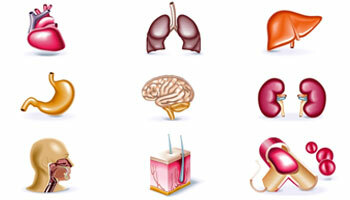 Organs are then formed by the functional grouping together of multiple tissues. The study of tissues is known as histology. In most animals, combinations of various tissues make up functional units called organs, and groups of organs work together as organ systems. For example, the human digestive system consists of a stomach, small intestine, large intestine, and several other organs, each a composite of different tissues. 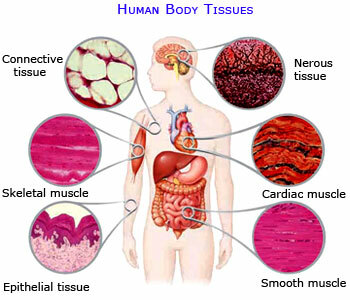 Different tissues have different structures that are suited to their functions. For example- epithelial tissue gives protection to the body, connective tissues form a framework and support for organs and the body as a whole, muscle tissue is composed of long cells called muscle fibers that are capable of contracting and nervous tissue is found in the brain, spinal cord and nerves. It is responsible for coordinating and controlling many body activities. It stimulates muscle contraction, creates an awareness of the environment, and plays a major role in emotions, memory, and reasoning. a loose network of connective–tissue elements that are interspersed throughout the kidneys and include the protective capsule that surrounds the organ. Many organs are organized into small, similar subunits often referred to as functional units, each performing the function of the organ. For example, the kidneys’ functional units, called nephrons, contain the small tubes mentioned in the previous paragraph. The total production of urine by the kidneys is the sum of the amounts produced by the two million individual nephrons. 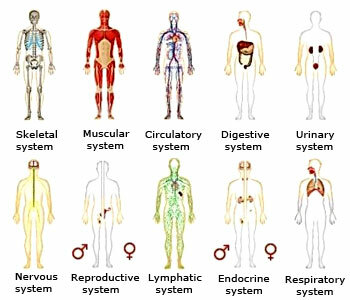 Human body systems The human body is a complex organism made up of several individual systems working together to create a balance known as "homeostasis. ".This balance is required to enable full function and survival. Without these systems, we would not be able to move, eat, defend against disease, eliminate waste from the body, create offspring, circulate blood or breathe. Organ systems represent a level of organization higher than organs. They carry out the major body functions of most animals. Each organ system consists of several organs and has specific functions, but the efforts of all systems must be coordinated for the animal to survive. For instance, nutrients absorbed from the digestive tract are distributed throughout the body by the circulatory system. But the heart, which pumps blood through the circulatory system, depends on nutrients absorbed by the digestive tract as well as on oxygen (O2) obtained by the respiratory system. Any organism, whether single–celled or an assembly of organ systems, is a coordinated living system. Thus, the body as a whole – the human organism is the combination of – all the atoms, molecules, cells, tissues, organs, and systems. Although capable of being dissected or broken down into many parts, the body is a unified and complex assembly of structurally and functionally interactive components, each working together to ensure healthy survival. 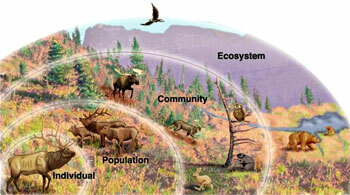 Levels of organization in ecosystems Ecosystems include more than a community of living organisms (abiotic) interacting with the environment (abiotic). A population is a group of individuals of a single species living in the same general area. Members of a population rely on the same resources, are influenced by similar environmental factors, and have a high likelihood of interaction with and breeding with one another. Communities are made of populations that interact with the environment and with each other. An ecological community is a group of actually or potentially interacting species living in the same location. Communities are bound together by a shared environment and a network of influence each species has on the other. An ecosystem consists of the biological community that occurs in some locale, and the physical and chemical factors that make up its non-living or abiotic environment. There are many examples of ecosystems -- a pond, a forest, an estuary, a grassland. The study of ecosystems mainly consists of the study of certain processes that link the living, or biotic, components to the non-living, or abiotic, components. Energy transformations and biogeochemical cycling are the main processes that comprise the field of ecosystem ecology. 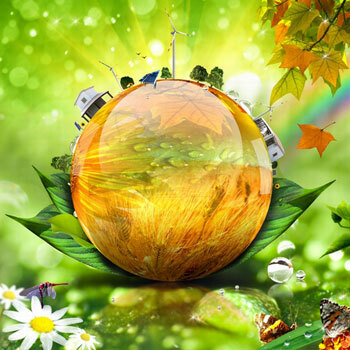 Biosphere - Sum of all the ecosystems established on Earth. The part of the earth and its atmosphere in which living organisms exist or that is capable of supporting life of all the organisms and systems on the planet. All the ecosystems of the world interact further and form biosphere or livable space of the earth. An organism is, therefore, not only an individual but also a part of population, community, ecosystem, biome and biosphere. 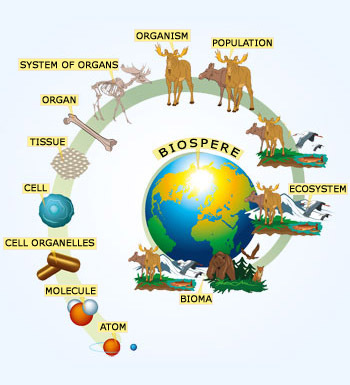 Biosphere has the highest level of organization with multitude of natural resources. Organizations at level of individual and above are known as higher levels of organization. It represents ecological hierarchy. Organizations below the level of individual (organ system, organ, tissue, cell, molecules, atoms ) are called as lower level of organization. Thus, organization is the arrangement of smaller components of structure, system or situation into larger ones and larger ones into still larger ones in hierarchy, where components of each level coordinate with one another towards a common goal. Organization is sort of hierarchy or pyramid of levels where each level is made of components of lower level and itself becomes a component of higher level.